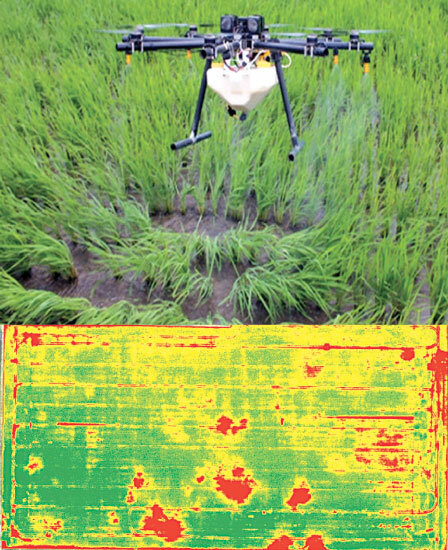 CIC Holdings PLC for the first time in the world has developed a technology to scan weeds in large paddy fields using battery powered drones (planes) and spray chemicals to them using the drone. The company’s research and development team has used studies and research for the past 8 years to introduce this novel technology which would also minimize the use of chemicals and minimize environmental impact. Samantha Ranatunge, Managing Director CIC Holdings said that they had invested around US 6,000 for this home grown research. “CIC has been pioneering in agriculture and research and this is a result of that effort that this ‘Precision Agriculture Practices’ (Smart farming) are being implemented,” he said. The usual pattern to eradicate weeds is to spray weedicides manually to the entire paddy field thus spending large amount of chemicals and money. “In this manner we can identify the weeds from the drone camera and then spray the chemicals to the affected area using GPS technology. 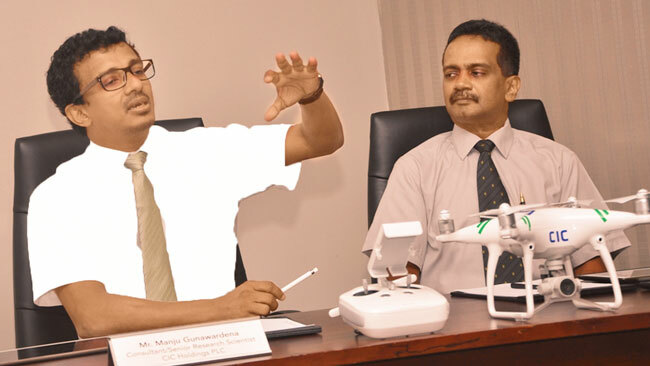 We will be flying the drone in low altitudes (10 or 15 meters) thus minimizing the impact of wind blowing the chemicals to other areas,” said research scientist, CIC Precision Agriculture Technologies Manju Gunawardane in Colombo on Friday. He said that there are some countries that spray weedicides using planes but this is the first time in the world that a small area is being identified and treated using the drone and GPS technology. “CIC will obtain a global patent for this,” he said. He said that the naked eye cannot do this and the end result is that huge amounts of manure and weedicides are being used. Currently they are obtaining more approvals from the Civil Aviation Authority and other institutions and after final research the technology would be deployed from next year, he said. “As a Corporate Social Responsibly we hope to make available this technology to other farmers free of charge as well,” he added. Non-Executive Director CIC Holdings and Professor, Peradeniya University Agriculture Faculty, Buddhi Marambe said that this technology would help Sri Lanka to further increase the current 4.5 metric tons per hectare yield of paddy. He also said that they are currently doing more research to identify the weeds by names and spray different kind of chemicals to it rather than using a single chemical. “We will next introduce this ‘Precision Agriculture Practices’ technology to tea, maize and sugarcane sector,” he said. To CIC brains this is modern technology and to our villages and farmers it is magic. This is an old technology and in China the weeding and manure by using drones, and these drones got the capability to carry up to 25 ltrs of liquid up to 2km rage, whilst this technology is already in action, our Mahadenamuthas trying to obtain patent rights for some old gadgets which already exist in developed countries. Haha I don't have a place to laugh. All this is BS. Is this new. Haha. At least professors who should have current knowledge should know this. I really cannot believe this widely open world, there are some profs wants to believe this is highly practical and works well with our rice farmers who already struggle to get a return from their produce. Sorry Buddhi, this is the reality. Go talke to a farmer, how many farmer you have talked to in your 20 year carrier. Did anyone said or we need airplanes or drowns to control weeds, then all our problems solved..be houndstooth my dear friend, then only you can die peacefully. Man money is not you take to your next life "if you are a Buddhist", I k ow you are. You still have time to turn around and be truthful trust me man do it, you don't believe how much happiness come to you right a way.. Good luck.